The Auctions Report displays how many eBay Motors auction listings you created each month, along with how many of them resulted in sales. 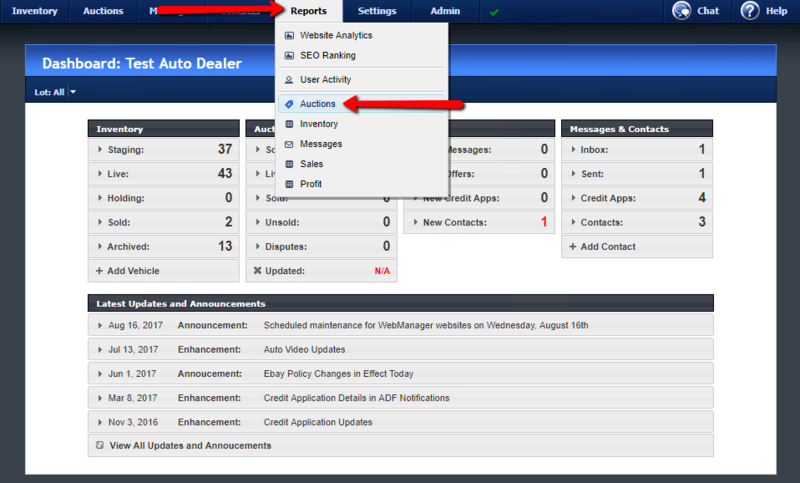 To access the Auctions Report, hover the mouse over Reports, and click Auctions. You can change the report range and date at the top of the screen by selecting a different number of months, and a different ending date. Auctions are counted toward the month that the auction listing started on eBay Motors. Auctions which had been scheduled but were cancelled before their start times are not included in this report. A summary of auctions which resulted in sales is displayed here, with the vehicle Year/Make/Model (click to view Vehicle Detail), the eBay Item # (click to view the auction on eBay), a link to the Auction Status, a link to the Sale Detail, and the start time of the auction.